A fast, medium telephoto, designed on the same principles as the 105mm Nikkor. The speed is a measure of the success with which this formula has been made to produce full useful correction so far out from the axis with older types of optical glass skillfully computed and treated by modern technology. Specify a brand name or a lens series, focal length and/or lens speed. The aperture stop is an important element in most optical designs. Its most obvious feature is that it limits the amount of light that can reach the image/film plane. Typically, a fast shutter will require a larger aperture to ensure sufficient light exposure, and a slow shutter will require a smaller aperture to avoid excessive exposure. A device called a diaphragm usually serves as the aperture stop, and controls the aperture. The diaphragm functions much like the iris of the eye – it controls the effective diameter of the lens opening. Reducing the aperture size increases the depth of field, which describes the extent to which subject matter lying closer than or farther from the actual plane of focus appears to be in focus. In general, the smaller the aperture (the larger the number), the greater the distance from the plane of focus the subject matter may be while still appearing in focus. The lens aperture is usually specified as an f-number, the ratio of focal length to effective aperture diameter. A lens typically has a set of marked "f-stops" that the f-number can be set to. A lower f-number denotes a greater aperture opening which allows more light to reach the film or image sensor. The specifications for a given lens typically include the maximum and minimum aperture sizes, for example, f/1.4–f/22. In this case f/1.4 is the maximum aperture (the widest opening), and f/22 is the minimum aperture (the smallest opening). The maximum aperture opening tends to be of most interest, and is always included when describing a lens. This value is also known as the lens "speed", as it affects the exposure time. Lenses with apertures opening f/2.8 or wider are referred to as "fast" lenses. Zoom lenses typically have a maximum relative aperture (minimum f-number) of f/2.8 to f/6.3 through their range. High-end lenses will have a constant aperture, such as f/2.8 or f/4, which means that the relative aperture will stay the same throughout the zoom range. A more typical consumer zoom will have a variable maximum relative aperture, since it is harder and more expensive to keep the maximum relative aperture proportional to focal length at long focal lengths; f/3.5 to f/5.6 is an example of a common variable aperture range in a consumer zoom lens. Micromotors and built-in motors of Nikon, Pentax and Sony digital SLR cameras provide moderately noisy and acceptably fast autofocus. With ultrasonic, linear or stepping motor it is possible to achieve very fast and virtually silent autofocus. Moreover, the use of linear or stepping motor ensures smooth continuous focusing which makes lenses with such types of motors ideal for video recording. The accuracy of autofocus does not depend on type of used autofocus motor but depends on focusing method (contrast or phase detection), autofocus algorithms, lighting conditions and other factors. Allows to perform final focusing manually after the camera has locked the focus automatically. Note that you don't have to switch camera and/or lens to manual focus mode. Electronic manual focus override is performed in the following way: half-press the shutter button, wait until the camera has finished the autofocusing and then focus manually without releasing the shutter button using the focusing ring. A technology used for reducing or even eliminating the effects of camera shake. Gyro sensors inside the lens detect camera shake and pass the data to a microcomputer. Then an image stabilization group of elements controlled by the microcomputer moves inside the lens and compensates camera shake in order to keep the image static on the imaging sensor or film. The technology allows to increase the shutter speed by several stops and shoot handheld in such lighting conditions and at such focal lengths where without image stabilizer you have to use tripod, decrease the shutter speed and/or increase the ISO setting which can lead to blurry and noisy images. rear focusing – focusing is performed by moving one or more lens groups positioned behind the diaphragm. since the front part of the lens does not move during focusing, petal lens hoods with good protection from stray light can be used. Aspherical elements (ASPH, XA, XGM) are used in wide-angle lenses for correction of distortion and in large-aperture lenses for correction of spherical aberration, astigmatism and coma, thus ensuring excellent sharpness and contrast even at fully open aperture. The effect of the aspherical element is determined by its position within the optical formula: the more the aspherical element moves away from the aperture stop, the more it influences distortion; close to the aperture stop it can be particularly used to correct spherical aberration. Aspherical element can substitute one or several regular spherical elements to achieve similar or better optical results, which allows to develop more compact and lightweight lenses. Low dispersion elements (AD, ED, LD, HLD, SD, UD etc) and fluorite elements minimize chromatic aberrations and ensure excellent sharpness and contrast even at fully open aperture. Organic Blue Spectrum Refractive Optics (BR Optics) material placed between convex and concave elements made from traditional optical glass provides more efficient correction of lateral chromatic aberrations in comparison with fluorite, UD and even Super UD elements. Diffraction elements (DO, PF) cancel chromatic aberrations at various wavelengths. This technology results in smaller and lighter lenses in comparison with traditional designs with no compromise in image quality. High refractive index elements (XR, UXR, HID, HR, HRI etc) minimize field curvature and spherical aberration. High refractive index element can substitute one or several regular elements to achieve similar or better optical results, which allows to develop more compact and lightweight lenses. Apodization element (APD) is in fact a radial gradient filter. It practically does not change the characteristics of light beam passing through its central part but absorbs the light at the periphery. It sort of softens the edges of the aperture making the transition from foreground to background zone very smooth and results in very attractive, natural looking and silky smooth bokeh. Lens construction – a specific arrangement of elements and groups that make up the optical design, including type and size of elements, type of used materials etc. Element - an individual piece of glass which makes up one component of a photographic lens. Photographic lenses are nearly always built up of multiple such elements. Group – a cemented together pieces of glass which form a single unit or an individual piece of glass. The advantage is that there is no glass-air surfaces between cemented together pieces of glass, which reduces reflections. The efficiency of image stabilizer is measured in stops and each stop corresponds to a two-times increase of shutter speed. For example, if you are shooting at focal length of 80mm and it is known that the efficiency of image stabilizer is 3 stops, it means that during handheld shooting at such focal length you can use shutter speed of 1/10 second which is exactly 23 times longer than the shutter speed 1/80 second needed to obtain sharp image in sufficient lighting conditions. The rotary zooming method means that the change of the focal length is achieved by turning the zoom ring and the manual focusing - by turning the separate focusing ring. The push/pull zooming method means that the change of focal length and the manual focusing is achieved by one and the same ring. The change of focal length happens when the photographer moves the ring towards the mount or backwards and the rotation of the ring leads to change of focus. Push/pull zooming allows for faster change of focal length, however conventional method based on the rotation of the zoom ring provides more accurate and smooth zooming. The lens features a zoom lock to keep the zoom ring fixed. This function is convenient for carrying a camera with the lens on a strap because it prevents the lens from extending. A lens hood or lens shade is a device used on the end of a lens to block the sun or other light source in order to prevent glare and lens flare. Flare occurs when stray light strikes the front element of a lens and then bounces around within the lens. This stray light often comes from very bright light sources, such as the sun, bright studio lights, or a bright white background The light source itself may be in the lens' angle of view, but it doesn't have to be to cause a lens flare. It is only necessary that stray light from the bright light source enter the lens. The geometry of the lens hood can vary from a plain cylindrical or conical section (much like a lamp shade) to a more complex shape, sometimes called a petal, tulip, or flower hood. These more complex shapes take into account the final image's shape and aspect ratio. This allows the lens hood to block stray light with the higher portions of the lens hood, while allowing more light into the corners of the image through the lowered portions of the hood, thereby reducing the amount of vignetting in the final image. Lens hoods are more prominent in long focus lenses because they have a smaller viewing angle than that of wide-angle lenses. For wide angle lenses, the length of the hood (away from the end of the lens) cannot be as long as those for telephoto lenses, as a longer hood would enter the wider field of view of the lens. Lens hoods that are supplied by the manufacturer of the lens are often designed to fit onto the matching lens facing either forward, for normal use, or backwards, so that the hood may be stored with the lens without occupying much additional space. Rubber lens hoods are flexible and generally collapse for storage. In addition, lens hoods can offer some degree of physical protection for the lens due to the hood extending farther than the lens itself. Angle of view describes the angular extent of a given scene that is imaged by a camera. It is used interchangeably with the more general term field of view. A camera's angle of view depends not only on the lens, but also on the sensor. Digital sensors are usually smaller than 35mm film, and this causes the lens to have a narrower angle of view than with 35mm film, by a constant factor for each sensor (called the crop factor). FL – focal length of a lens. A lens mount is an interface — mechanical and often also electrical — between a photographic camera body and a lens. It is confined to cameras where the body allows interchangeable lenses, most usually the rangefinder and SLR cameras. A lens mount may be a screw-threaded type, a bayonet-type, or a breech-lock (friction lock) type. 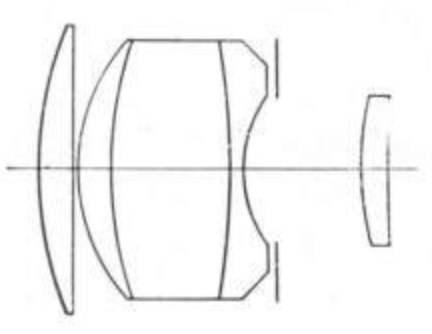 Modern still camera lens mounts are of the bayonet type, because the bayonet mechanism precisely aligns mechanical and electrical features between lens and body. Screw-threaded mounts are fragile and do not align the lens in a reliable rotational position. Lens mounts of competing manufacturers (Canon, Nikon, Pentax, Sony etc.) are always incompatible. In addition to the mechanical and electrical interface variations, the flange focal distance from the lens mount to the film or sensor can also be different. These incompatibilities are probably due to the desire of manufacturers to lock in consumers to their brand. Distance from the focal plane (film or sensor) to the subject. Distance from the front of the lens to the subject. Determines how large the subject will appear in the final image. A magnification ratio of 1:1 means that the image of the subject formed on the film or sensor will be the same size as the subject in real life. For this reason, a 1:1 ratio is often called "life-size". A lens is not considered to be "true" macro unless it can achieve at least life-size magnification. Excluding caps and detachable accessories such as lens hood, close-up adapter, tripod adapter etc. A form of optical aberration, a deviation from rectilinear projection in which straight lines in a scene remain straight in an image. Although distortion can be irregular or follow many patterns, the most commonly encountered distortions are radially symmetric, or approximately so, arising from the symmetry of a photographic lens. These radial distortions can usually be classified as either barrel distortions or pincushion distortions. In barrel distortion, image magnification decreases with distance from the optical axis. The apparent effect is that of an image which has been mapped around a sphere (or barrel). Fisheye lenses, which take hemispherical views, utilize this type of distortion as a way to map an infinitely wide object plane into a finite image area. In a zoom lens barrel distortion appears in the middle of the lens's focal length range and is worst at the wide-angle end of the range. In pincushion distortion, image magnification increases with the distance from the optical axis. The visible effect is that lines that do not go through the centre of the image are bowed inwards, towards the centre of the image, like a pincushion. In photography, distortion is particularly associated with zoom lenses, particularly large-range zooms, but may also be found in prime lenses. Barrel distortion may be found in wide-angle lenses, and is often seen at the wide-angle end of zoom lenses, while pincushion distortion is often seen in older or low-end telephoto lenses. Correction usually requires cropping out curved edges of the corrected image which can influence the composition. Moreover, correction leads to redistribution of image resolution – the center of the frame will lose some sharpness and the edges become sharper after the correction of pincushion distortion and vice versa, the center of the frame become sharper and the edges will lose some sharpness as the result of correction of barrel distortion. The results of correction could be especially noticeable for wide-angle lenses because most of lenses of such class suffer from resolution drop at the edges and especially at the corners of the frame. Thereby the correction should be performed only for those pictures which contain straight lines (f.e. images of architecture). Vignetting is a reduction of an image's brightness or saturation at the periphery compared to the image center. Vignetting is often an unintended and undesired effect caused by camera settings or lens limitations. However, it is sometimes deliberately introduced for creative effect, such as to draw attention to the center of the frame. A photographer may deliberately choose a lens which is known to produce vignetting to obtain the effect, or it may be introduced with the use of special filters or post-processing procedures. Correction of vignetting requires brightening of the edges and corners of the frame. Such correction however increases digital noise at the corresponding areas of the frame because digitally brightening an image amplifies both the signal and the noise equally. That’s why shooting at the maximum aperture should be avoided whenever possible since the all lenses have the strongest vignetting at their maximum aperture. In some cases, the optical vignetting can be minimized by closing of the aperture by one or several stops. However even the significant closing of the aperture may not have the noticeable effect with some models of wide-angle lenses. Helps keep lenses clean by reducing the possibility of dust and dirt adhering to the lens and by facilitating cleaning should the need arise. Applied to the outer surface of the front and/or rear lens elements over multi-coatings. Provides correction of aberrations and ensures constantly high image quality at the entire range of focusing distances from infinity down to the closest focusing distance. It is particularly effective for the correction of field curvature that tends to occur with large-aperture, wide-angle lenses when shooting at close ranges. The lens was designed for use with 35mm film SLR cameras with the mirror locked in the up position. The lens extended into the SLR's mirror box when mounted. Mirror lock-up must be activated prior to mounting the lens; otherwise its rearmost element would be in the way as the mirror flipped up and down during exposure. A separate optical viewfinder had to be mounted on the accessory shoe to confirm angle of view, because when the mirror is in the up and locked position, the subject is no longer visible through the viewfinder. There are two basic types of lens filters - circular that screw directly on the filter thread in front of the lens, and square ones, which slot into a filter holder. Circular screw-on filters protect the surface of the front lens element against dust, moisture, fingerprints, scratches and bumps. Square gelatin filters are dropped into place in slot that keeps it flat and parallel to the focal plane in order to maintain optimal image quality. Drop-in filters are mostly used in super telephoto lenses due to the large size of the front lens element. The primary function of lens filters is to improve the image quality and/or produce special effects. Format refers to the shape and size of film or image sensor. 35mm is the common name of the 36x24mm film format or image sensor format. It has an aspect ratio of 3:2, and a diagonal measurement of approximately 43mm. The name originates with the total width of the 135 film which was the primary medium of the format prior to the invention of the full frame digital SLR. Historically the 35mm format was sometimes called small format to distinguish it from the medium and large formats. APS-C is an image sensor format approximately equivalent in size to the film negatives of 25.1x16.7mm with an aspect ratio of 3:2. Weather sealed lenses contain a rubber material which is inserted in between each externally exposed part (manual focus and zoom rings, buttons, switch panels etc.) to ensure it is properly sealed against dust and moisture. Lenses that accept front mounted filters typically do not have gaskets behind the filter mount. It is recommended to use a filter for complete weather resistance when desired. SLR cameras require stopping down to the chosen aperture immediately before exposure, in order to permit viewing and focusing at full aperture up to the moment the shutter is released. Automatic – the actuating lever in the camera, operated by the shutter release, closes the diaphragm down during the shutter operation. On completion of the exposure, the diaphragm re-opens to its maximum value. The image stabilizer has Hybrid IS technology which corrects not only angle but also shift camera shake, which is more pronounced in close-range shooting when a camera moves parallel to the imaging scene. Hybrid IS dramatically enhances the effects of image stabilization during shooting, including macro shooting, which had proven difficult for conventional image stabilization technologies. The image stabilizer has Dynamic IS technology which especially effective when shooting while walking because it compensates strong camera shake. Dynamic IS activates automatically when the camera is set to movie shooting. Corrects vertical and horizontal camera shake. Mainly effective for shooting still subjects. Corrects vertical camera shake during following shots in a horizontal direction. Corrects horizontal camera shake during following shots in a vertical direction. Corrects vertical camera shake during following shots in a horizontal direction. The lens incorporates Intelligent OS with algorithm capable of panning in all directions. In Mode 2, the movements of subjects can be captured with panning effects even when the camera is moved horizontally, vertically, or diagonally — regardless of the position of the lens. Corrects camera shake only during exposure. During panning shots, corrects camera shake during exposure only in one direction the same as Mode 2. Effective for following fast and irregulary moving subjects. It is often thought that image blur caused by camera shake can be prevented by using a tripod. Actually, however, even using a tripod may result in image blur because of tripod vibration caused by mirror or shutter movement at the time of exposure. The image stabilizer automatically differentiates the frequency of the vibration from that of camera shake, and changes algorithm to correct image blur caused by slight tripod vibration. Corrects vertical and horizontal camera shake. Automatically detects panning and then corrects camera shake only in one direction. Corrects vertical and horizontal camera shake when shooting from a moving vehicle, or some other unstable position. Panning is not detected. Allows a continuous shooting frame rate and release time lag similar to those that are possible when image stabilizer is turned off. Automatically detects panning and then corrects camera shake only in one direction. Copyright © 2012-2019 Eugene Artemov. All rights reserved. Translation and/or reproduction of website materials in any form, including the Internet, is prohibited without the express written permission of the website owner.